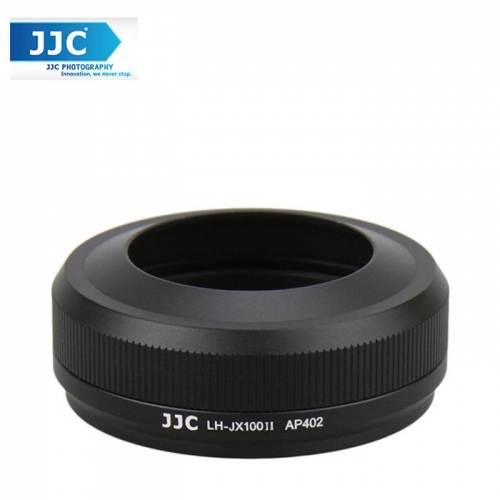 The silver or black JJC LH-JX100II 2-item accessory set consists of a lens hood and adapter ring. It is an upgrade version of the previous JJC LH-JX100 vented lens hood, specially designed for the 23mm lens of the FUJIFILM X100 and X100S camera. The adapter ring facilitates the attachment of the lens hood or a 49MM thread filter to the lens. The product set helps to minimize lens flare by deflecting stray light from entering lens. And since the end of the lens is extended, it also provides additional protection to the camera and lens from accidental impact, bumps, and scratching. The hood features a non-glare matte finish on the interior surface to further prevent or limit lens flare. No vignetting will caused by attaching a filter or the hood. In addition, the original FUJIFILM lens cap can be mount onto the lens hood, so you can use the original lens cap without removing the hood.